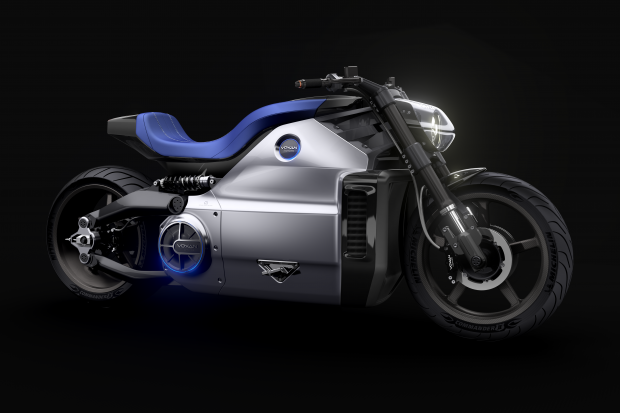 This incredible electric motorcycle was introduced during the Paris Motorbike Show today. The design of the Wattman by Sacha Lakic is very massive and some people will like it… or not! Personally, I find it sublime! It is totally built around the motor and the battery pack with an aluminium exoskeleton that replaces the traditional frame. 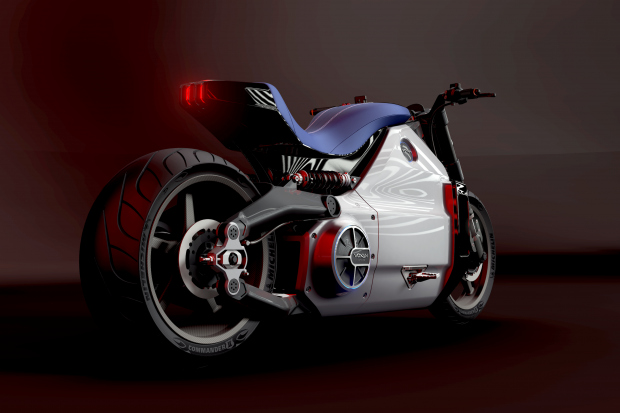 This huge motorcycle weighs 350 kg but provides incredible performances: its 200 HP permanent magnet motor delivers a 200 Nm instant torque until 10.500 rpm. The power is sent to the rear wheel by a transmission belt. It gives us an incredible acceleration: the 0-100 km/h in 3.4 s and the 0 to 160 km h in only 5.9 s, for a maximum speed of 170 km/h! Is it enough to convince the most sceptical people to buy an electric motorcycle? Let’s talk about range anxiety! The Wattman has a “compact” lithium-ion battery pack of 12,8 kWh that allows it a 180 km range (NEDC cycle). It can be charged in only 30 min with a “Combo” outlet but you can also use a domestic plug (the charging time will be longer). We don’t know the price of the Wattman yet but Voxan explains that the first deliveries should start in 18 months. It will be produce in France, in the “Manufacture de Véhicules Electriques” near Cambrai. This new electric motorcycle gives us a vision of the future of Voxan, according to its CEO, Gildo Pallanca Pastor: “Reviving Voxan starts from a technological challenge, focusing our best technologies developed with Venturi in a motorcycle. This is an outstanding product that is launched today, a real pride for our team. Wattman will launch Voxan on a new path, the path of the future”. A beautiful project, which we hope will lead one day to more affordable electric motorcycles… as the Wattman will certainly be a very exclusive product!